On Tues 2nd of July we travelled(all family and Julie Blanchard) to Claire and Paul Williams in Chesterfield for a pre Europeans training session with Peter Storr our team trainer. What a great night as the hospitality, company, weather and food was all fantastic.Rembrandt DDH had a nice break in the stables while Erin Williams rode Dynasty and then I had my lesson after. We worked on Rembrandt ddh not taking over and letting me do my job and it all went well, making me feel that everything Julie and I have been working on since my last squad training has paid off. 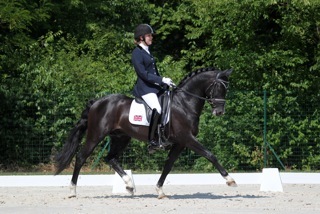 Remy behaved beautifully as always and worked very hard. After Erins lesson on Danny Boy B we all sat and chatted about our preparations for Poland, there seems an awful lot to organise. Thank goodness for mums and dads! !